Across from Place du Canada in Montreal City, Quebec stands the historic building home to Mary, Queen of the World Cathedral. The Cathedral-Basilica of Mary, Queen of the World or Cathedrale Marie-Reine-du-Monde in French, located in Montreal City, is the third largest church in Quebec, Canada. Construction on this cathedral began in 1870 with the first stone being laid but due to a shortage of funds, the process lingered on. It was finally consecrated in 1894 as Saint-James Cathedral, changing to a minor basilica in 1919 by Pope Benedict XV with final changes be redirected in 1955 to Mary, Queen of the World. Picture of the historic building home to Mary, Queen of the World Cathedral in Montreal City in Quebec, Canada. 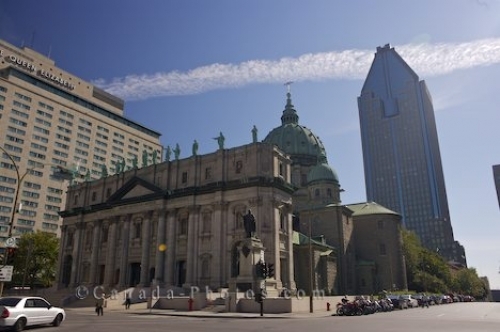 Located on Cathedral Street in Montreal City across from Place du Canada, the Mary, Queen of the World Cathedral has become a popular tourist attraction. In May of 2006, the cathedral was designated as a National Historic Site of Canada and is now surrounded by tall skyscrapers located in the city core. Basilique Marie-Reine-du-Monde Cathedrale, Mary Queen of the World Cathedral, across from Place du Canada, Centre Ville, Montreal, Quebec, Canada.